Valencia Spain - guide to Valencia Spain hotels etc. Valencia is a medium-sized port city (the third largest city in Spain) and close to Valencia airport on the Costa del Azahar in Spain. It is the capital of province of Valencia. The city of Valencia and the surrounding area will attract millions of visitors from around the world given that the city of Valencia has been chosen to host America's Cup in 2007. 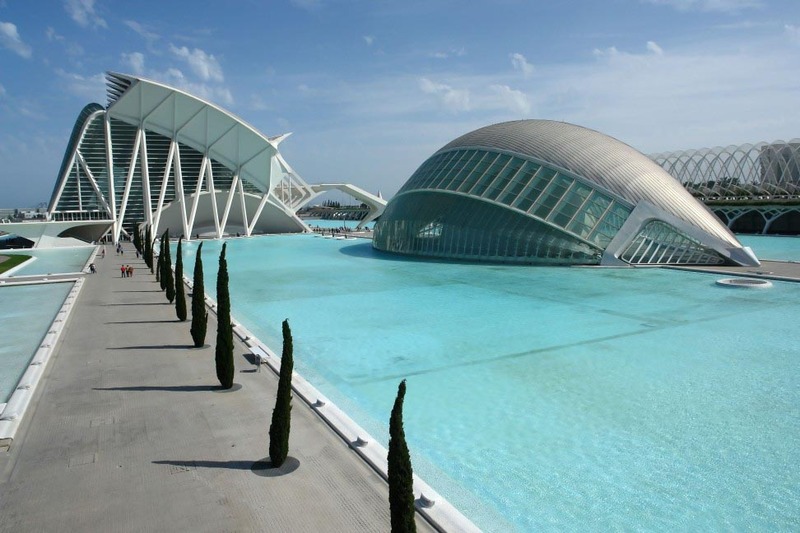 The City of Arts and Sciences in Valencia is Europe’s largest leisure complex and combines education and entertainment. Within the ‘City’ you will find a futuristic opera house, planetarium, IMAX cinema, vast science museum, botanical gardens and a huge aquarium. Book a hotels near the City of Arts and Sciences Valencia. In the Museum of Fine Arts you will find outstanding works from the Valencian School: Joan de Joanes, Ribalta, Espillosa, Vicente López, Sorolla, Pinazo, etc. International works such as Velázquez's self-portrait, works by Pinturicchio, Andrea del Sarto, Van Dyck, Murillo, El Greco, Goya, etc. Estadio Mestalla is a football stadium in Valencia, Spain. The stadium is the home ground of Valencia FC.There are a number of hotels near the Valencia FC.stadium. Valencia is a city that offers everything and more. Restaurants, Bars, Cafés, Theatre, Music, Dance, Festivals, Fiestas, Culture, Arts - If you haven't visited Valencia, then it's time you did. see also festivals in Valencia.